For anything to bloom, though, the buds must grow first, and our buds are the things we do and the choices we make. Nature creates new life for spring; my spring goal is to liven up my own life with new hobbies, experiences, and knowledge (all under the broad category of “trying new things”). Some of these new things are going great – I started indoor gardening a week ago, and the first of my lavender seeds has sprouted. Other things, such as the voice lesson audition I have this Saturday, terrify me, but I know that they’re going to be good experiences. Are you feeling that spring energy too? Here’s a few things to try out this spring. Gardening can seem off-limits if you’re in an apartment like me, but indoor gardening is actually way easier than I thought it would be. I am growing my seeds in the bottom of an egg carton, because reducing waste is also one of my goals this year. I keep the seedlings under two lamps, with a sheet of plastic wrap over top of the soil to keep the moisture in. If you’re strapped for cash or aren’t sure that you want to spend money on it yet, you can start gardening with just your kitchen scraps. You can regrow all sorts of plants this way – green onions, garlic, leeks, avocados, even pineapples. If it sprouts in your fridge, it’ll grow in your window (probably). 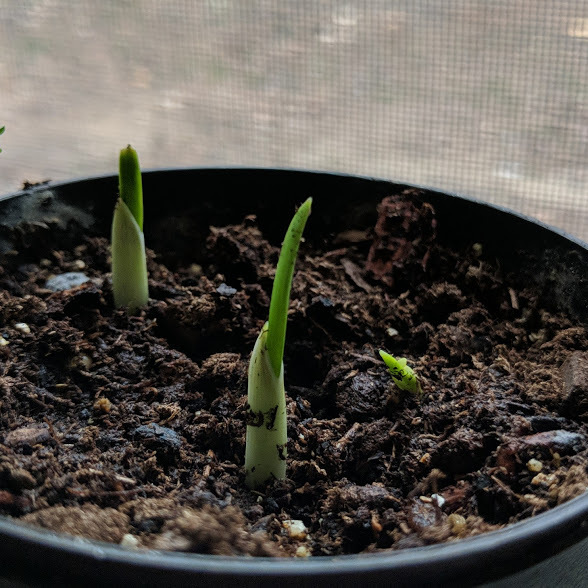 I grew these garlic shoots from cloves that sprouted in the fridge. It may sound like a kid’s project, but raising insects is actually a fairly popular hobby – and it’s not just for beekeepers! Many people raise mantises, butterflies, and other insects as well. If you have kids, raising insects is a great way to foster their love of science and get them curious about the world. If you don’t have kids, it’s just plain cool. Raising butterflies is the most common and accessible type of insect rearing. You’ll want to choose a butterfly that is native to your region and is easy to raise. Many stores sell butterfly raising kits, which include the caterpillars, food, and a netted enclosure to raise them in. This is a great way to get your feet wet! If you want to start raising the creepier crawlies, you’ll likely need to gather your own materials. The best way to learn hobbies like these is to talk to people who are already established, so see if you can find a hobby group in your area, or join an online insect community. I might be biased as an artist, but outdoor photo shoots are some of the most fun I’ve ever had. When you go with a group of friends, it’s a great bonding experience, and the photos that result mean you’ll remember it forever. You don’t have to know photography to try this out – and with the quality of phone cameras these days, you don’t even need a “real” camera. All you need is a spot to shoot. Friends are definitely a bonus, though! If you have botanical gardens near you, visit once the garden is in bloom. It’s a ton of fun to model in and around flowers, and the flowers make fantastic models themselves. If that’s not your speed, why not see if there are any abandoned places nearby? Decrepit buildings and lost-to-time theme parks make for great photo shoots – just make sure you aren’t trespassing! Your best bet is to ask the owner of the property for their permission beforehand. Spring blooms make great subjects for art as well. Again, it’s ok if you’re not good at art – you’re doing this to try something new, remember? And art is a skill that’s learned just like any other. You don’t need anything special to start drawing – any piece of paper and writing implement will do. Pencil is best to start with, as you can erase any mistakes you make. If you’re just starting, make efforts to draw lightly, and you’ll thank yourself for it later. Drawing too heavily makes it harder to erase stray lines and mistakes, and your lines can end up leaving grooves in the next page. Just like with gardening, drawing is an amazingly rewarding hobby where you can truly see your progress. You might see it a little slower than with your plants, but few things will make you feel prouder than seeing how far you’ve come. Just try it – spend a month doing one drawing a day, and once your sketchbook is full, flip back through and compare the first and last drawing. So, what are you starting this spring?